When exploring and preparing data in DSS, you always get immediate visual feedback, no matter how big the dataset that you are manipulating. To achieve this, DSS works on a sample of your dataset. By default, the first 10,000 records of your dataset are selected for the sample. While this sampling method does not provide the best sample quality, it allows you to get your sample very quickly, whatever the size of your dataset. For best performance in interactive exploration, the sample is always loaded in RAM. It is therefore crucial that you do not configure a sample so large that it would not fit in the memory of the Data Science Studio backend. For best performance, it is recommended that you do not use samples above 200 000 records. DSS provides many sampling methods for exploration and data preparation. Not all sampling methods are available in the different locations. Exploration / data preparation have the most available sampling methods, thanks to the fact that the output of the sampling for exploration and data preparation must always fit in memory. This sampling method simply takes the first N rows of the dataset. If the dataset is made of several files, the files will be taken one by one, until the defined number of records is reached for the sample. This method is by far the fastest sampling method, as only the first records need to be read from the dataset. However, depending on how your data is organized in the dataset, it can provide a very biased view of the dataset. This method randomly selects N records within the whole dataset. This method requires a full pass reading the data. The time taken by this method is thus linear with the size of the dataset. This method randomly selects approximately X% of the records. This method requires a full pass reading the data. The time taken by this method is thus linear with the size of the dataset. Beware that if you have a very large dataset, this could lead to extremely high sample sizes. This method randomly selects a subset of values and chooses all rows with these values, in order to obtain approximately N rows. This is useful for selecting a subset of customers, for example. This sampling method requires 2 full passes reading the data. The time taken by this method is thus linear with the size of the dataset. This method is useful if you want to have all records for some values of the column, for your analysis. For example, if your dataset is a log of user actions, it is more interesting to have “all actions for a sample of the users” rather than “a sample of all actions”, as it allows you to really study the sequences of actions of these users. “Column values subset” sampling will only provide interesting results if the selected column has a sufficiently large number of values. A user id would generally be a good choice for the sampling column. This method randomly selects N rows, ensuring that the distribution of values in a column is respected in the sampling. Ensures that all values of the column appear in the output. This method may return a few more than N rows. This method randomly selects X% of the rows, ensuring that the distribution of values in a column is respected in the sampling. Ensures that all values of the column appear in the output. This method may return a bit more than X% rows. This method randomly selects approximately N rows, trying to rebalance equally all modalities of a column. This method does not oversample, only undersample (so some rare modalities may remain under-represented).In all cases, rebalancing is approximative. This method randomly selects approximately X% of the rows, trying to rebalance equally all modalities of a column. This method does not oversample, only undersample (so some rare modalities may remain under-represented). In all cases, rebalancing is approximative. This method takes the last N rows of the dataset. This method requires a full pass reading the data. The time taken by this method is thus linear with the size of the dataset. If the dataset is partitioned, by default, DSS will use all partitions to compute the sample. You can also explicitly select some of the partitions. 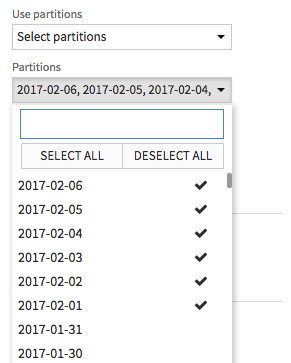 Selected partitions can be entered manually. The first time you open a dataset in Explore, the sample will be computed according to the default sampling parameters. Once a sample has been computed, Data Science Studio will not recompute each time, but reuse it. If the configuration of the dataset has been changed in the « Configure dataset » screen. At any time, you can also open the Sampling configuration box and click the “Save and Refresh Sample” button to recompute the sample. In addition, for some kinds of datasets, you can ask DSS to automatically recompute the sample each time the content of the dataset changes. This is NOT possible for SQL-based datasets. Note that checking if the dataset content changed can be slow for very large files-based datasets, as Data Science Studio needs to enumerate all files (especially for S3 datasets).